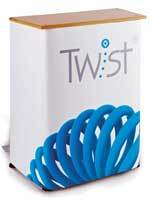 The Twist Media Banner provides the ability to include a monitor within your banner stand display. The patented tensioning system serves as a great aid to ensure that your graphic will hang straight every time. With multimedia more accessible to both business and personal users, the Twist Media has been made to allow the use of moving image and sound within a traditional banner stand. Quick and easy to erect, the Twist Media Banner takes approximately 90 seconds to set up with graphic and lights. To ensure the stability of the Twist banner, the base is made from 3mm stainless steel, which is then powder coat in silver as standard. Hardware Dimensions (mm): 2130 (h) x 800 or 1000(w) x 300 (d).